On many of the Division of Wildlife's trucks driven by district wildlife managers and biologists, there's a bumper sticker with a succinct, yet important message, "A fed bear is a dead bear." Feeding bears, whether intentionally or inadvertently, teaches bears that people are a ready source of food, particularly when supplies of berries, acorns and other natural food are in low supply. "Bears are intelligent critters that can live for more than 20 years, and once they learn to associate people with food, they won't forget," said Tom Beck a Division research biologist who has studied black bears extensively. "The next time there is a failure of the beny or acorn crop, bears will return to the same place where they've found human food in the past," Beck explained. "Feeding bears that have already been eating food provided by people only reinforces bad behavior," he said. In addition, feeding big game - which includes black bear - is illegal in Colorado. A person or people who are guilty of feeding big game can be subject to a fine. While habitat conditions are good in many areas of the state, poor conditions along Colorado's northern Front Range, around Grand Junction and in portions of Pitkin, Eagle and Summit counties have resulted in suggestions from some local residents that the Division should begin a feeding program. The Division has received dozens of calls from homeowners in those areas who have had bears feeding near their homes. In some cases, bears have entered homes in search of food they smell wafting from open windows and doors. In nearly all cases, the bears have learned to associate people with food because they've found trash, pet food, bird feeders, livestock feed and other edibles lying around homes or inside garages and sheds. John Ellenberger, the Division's big game coordinator, said feeding would only increase problems. "We don't want to habituate bears to food provided by people," Ellenberger emphasized. "Bears are coming to people for food because of the dry conditions and a freeze in some areas that killed blossoms on beny bushes and oak brush in the mid-elevation shrub habitat where they feed. We're having problems because people have built homes right in the middle of the brush habitat that bears depend on and some have left food out that bears have become accustomed to." Both biologists emphasized that efforts to feed bears would also be ineffective. "It wouldn't do any good to put food up in higher elevations away from people because bears normally feed at lower elevations this time of year where the berries and acorns are," Beck said. In good habitat years, bears are satisfied with their natural forage. 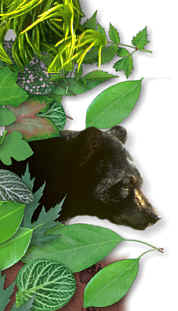 When the habitat is in poor shape, bears are attracted to human food in and around homes and cabins scattered through the very same habitat. Feeding would not be practical for a logistical standpoint either, Ellenberger said. "Even in the best bear habitat we have, the density of bears is only about one per square mile compared to 50 to 100 deer per square mile in top habitat. Because of the low density, feeding stations wouldn't work." And only a small percentage of bears will die this winter during hibernation because of the poor forage. Some young animals may not survive the winter. But adult bears, including sows that produce young, will make it through the winter. 'This is part of a natural cycle that has always occurred with bears," Ellenberger said. "In good habitat years, more young animals survive and in poor years, some of the young will not make it. "That's how nature works in a natural setting." Feeding bears could effectively turn Colorado's wild lands into wildlife parks. "These would no longer be truly wild animals," Beck said. No matter how good the habitat, there will be localized problems in Colorado every year, Beck said. And until Colorado residents learn to live with bears and not entice them with food inadvertently left outside, people-bear encounters will continue. "Feeding will only reinforce the behavior we're trying to avoid and end up causing more problems," Ellenberger reiterated. "The large majority of adult bears will survive even if they don't get as much to eat as they typically would this summer and fall. "If we want to continue to have wildlife species such as bears, it's our responsibility as citizens of this state to learn to live with them and that means making changes ourselves," he said. "If we don't, we risk losing wildlife species that help make Colorado such a special place for all of us to live."